Methane gas has been synthesized from wustite, calcite and water at high temperatures and pressures in the diamond anvil cell, demonstrating abiogenic pathways for the formation of hydrocarbons in the Earth's deep interior. 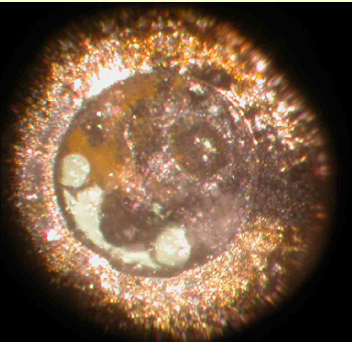 Bubbles formed in the mixture (bottom, left and near the center in the photomicrograph above) upon decompression to 0.5 GPa after laser heating at 5.7 GPa give a Raman spectrum consistent with the formation of methane. For more information, and to download a reprint of the paper [Scott, H., et al., Proc. Nat. Acad. Sci., 101, 14023-14026 (2004)], see this link. For continuing highlights, ABC News - Does Deep Earth Host Untapped Fuel?